Michael you left us suddenly without allowing us to say we love you and goodbye. You will be remembered as a beautiful person with love of life, friendship towards all and an exceptional person. Treasured son of Rod and Jeanette, brother to Kelly and Shannon, brother- in-law to Mark and Kim, Uncle to Marlee, Zara, Coby and Eva and partner Laura. 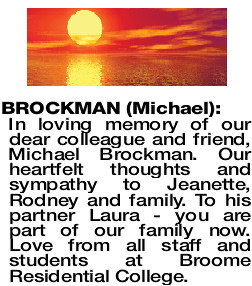 The Funeral Service to celebrate the life of Michael Locke Brockman of Broome formerly of Gidgegannup will take place in our Chapel 312 South Street Hilton commencing at 3.00pm THURSDAY (11.4.2019). Cremation will take place privately at a later time. 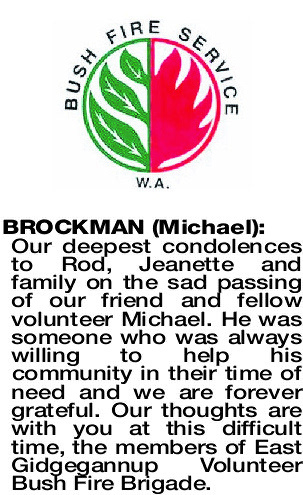 A memorial service for Michael will be held at the Broome Fishing Club on SATURDAY (27.4.2019) at 4.00PM. 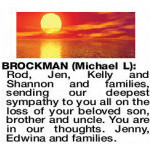 BROCKMAN MICHAEL Heartfelt sympathy to Rod, Jen, Kelly, Shannon and families on your sad loss. Farewell Michael, you will be remembered for your free spirit and caring nature. Love from Anne, Bill and family xxxxx. 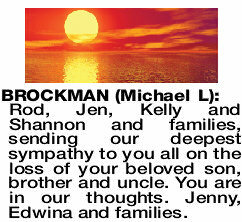 Rod, Jen, Kelly and Shannon and families, sending our deepest sympathy to you all on the loss of your beloved son, brother and uncle. You are in our thoughts. Jenny, Edwina and families. 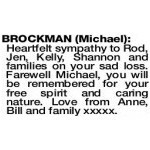 BROCKMAN MICHAEL Our deepest condolences to Rod, Jeanette and family on the sad passing of our friend and fellow volunteer Michael. He was someone who was always willing to help his community in their time of need and we are forever grateful. 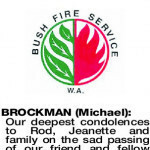 Our thoughts are with you at this difficult time, the members of East Gidgegannup Volunteer Bush Fire Brigade. 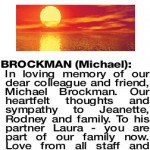 BROCKMAN MICHAEL In loving memory of our dear colleague and friend, Michael Brockman. 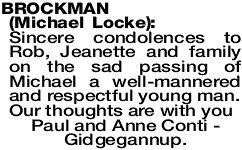 Our heartfelt thoughts and sympathy to Jeanette, Rodney and family. To his partner Laura - you are part of our family now. Love from all staff and students at Broome Residential College. 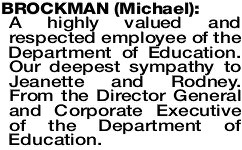 A highly valued and respected employee of the Department of Education. 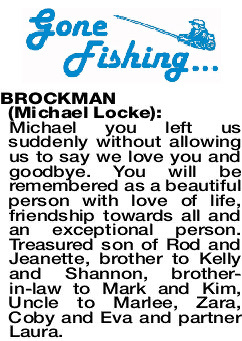 Our deepest sympathy to Jeanette and Rodney. 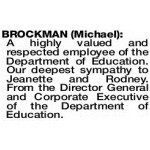 From the Director General and Corporate Executive of the Department of Education. 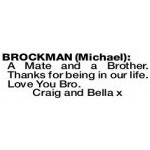 BROCKMAN MICHAEL A Mate and a Brother. Thanks for being in our life. Love You Bro. 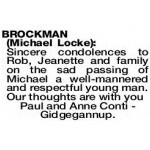 Sincere condolences to Rob, Jeanette and family on the sad passing of Michael a well-mannered and respectful young man. Paul and Anne Conti - Gidgegannup.